I am an artist based in Birmingham, England. My practice uses printmaking processes. I gained a BA (honours) Degree in Fine Art from Wolverhampton University specialising in Printmaking and an MA in Fine Art from Coventry University. I am an arts facilitator and manage Sandwell Third Age Arts: a charity delivering arts experiences to improve health and well-being. 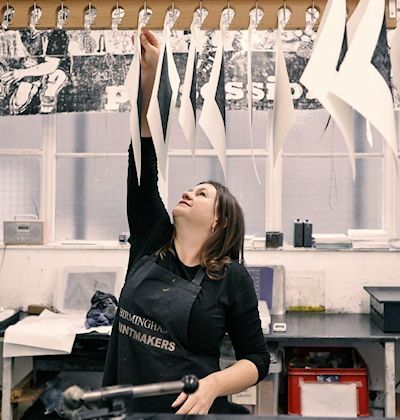 I am a director of Birmingham Printmakers, an open access print workshop, and a director of Make It Better C.I.C. supporting communities to live well through the arts. My work has been shown in several national print competitions and in shows across the UK. ‘Re-cast’ at Galerie Mayci, Moseley, Birmingham. ‘Manhole Covers: Pictures beneath your feet’ at Nuneaton Museum & Art Gallery. ‘The Journey Series’ at the Theatre Bar, Old Joint Stock, Birmingham. ‘Lucky Roars & Love Me’ at Malvern Hills District Council Chambers. ‘Printmaker in Focus’ at Wrexham Arts Centre, Wales. ‘Things Half Forgotten’ at Haden Hill House, Cradley Heath. ‘Red Echoes at the Window’ , Birmingham. ‘States of Mind’ at Solihull Sixth Form College, West Midlands. ‘Sharon Baker: Selected Prints’ at West Midlands Regonal Arts Headquarters, Birmingham. ‘Sharon Baker: woodcuts & Lino Prints’ at Rugby Library Gallery. Selected & Juried Group Exhibitions. Forthcoming: ‘Micro’ at Air Gallery, Altrincham, Cheshire 19th April-11th May. Forthcoming: ‘Print in Place’ at Gallery Steel Rooms, Brigg, North Lincolnshire 18th May-29th June. Leamington Spa Open 2019, Leamington Spa Art Gallery & Museum. Birmingham Printmakers at the Birmingham Midland Institute. 10th Coventry Open Exhibition, Herbert Museum & Art Gallery, Coventry. 166th Open Exhibition 2018 Royal West of England Academy, Bristol. RBSA Print Prize Exhibition, Royal Birmingham Society of Artists, Birmingham. Derby Print Open, Banks Mill Studios, Derby. ‘Rendez-vous aux Jardins: L’Europe des Jardins’, Cairnhill, Roiux Martin, France. Saltaire Open Houses Arts Trail, Saltaire, Yorkshire. NNcontemporary Art Open Exhibition Biennial 2018, Northampton. Teeside Print Prize 2017, Saabat Gallery, Middlesbrough. RWA 165th Open Exhibition. Royal West of England Academy, Bristol. Leamington Spa Open 2017, Leamington Spa Art Gallery & Museum. ‘The Masters 2016’ Etching Exhibition at Bankside Gallery, London. Impress’16 National Contemporary Print Exhibition, Stroud, Gloucestershire. ‘Salon’ at Water Hall Gallery, Birmingham Museum & art Gallery. National Open Print Exhibition, Bankside Gallery, London. Birmingham Printmakers at the Birmingham & Midlands Institute, Birmingham. ‘Birmingham Today Competition’, RBSA Gallery, Royal Birmingham Society of Artists, Birmingham. ‘Birmingham Printmakers: 30 Years of Printmaking 1983-2013’, at Birmingham Museum & Art Gallery. ‘The Ludlow Open’, Harley Centre, Ludlow College, Ludlow. ‘The Worcester Open’, Worcester City Museum & Art Gallery, Worcester. ‘Summer Exhibition’ Birmingham Botanical Gardens. ‘Print-side’ at the Bond Gallery, Birmingham, with Birmingham Printmakers. ‘RE Open’ The Royal Society of Painter-Printmakers, Bankside Gallery, London. Printmakers Council’s ‘8th British International Mini Print Exhibition’, London Print Workshop & touring until 2014. ‘Wrexham Print international’, Oriel Wrecsam, Wales. ‘Bainbridge Open’ Print Show, London. ‘We are Birmingham’ at the Bond Gallery with Birmingham Printmakers. ‘Birmingham Printmakers Staff House Gallery Show’, Birmingham University. ‘Pushing Print’ Ingoldsby Gallery, Pie Factory & Old Town Gallery, Margate, Kent. ‘Impress ’09’ National Printmaking Festival, Stroud. ‘RBSA Print Prize Exhibition’ RBSA Gallery, Birmingham. ‘Artfest Birmingham’ Birmingham Council House Chambers. ‘New Art Birmingham NAB 2007’ Curzon Street Station, Birmingham. ‘Birmingham Open Art Show’ Gas Hall, Birmingham Museum & Art Gallery. ‘Virtual’, Ernst & Young Offices, Birmingham. ‘A Stitch in Time’, Riverside Gallery, Richmond, London. ‘Derby City Open’, Derby City Art Gallery. ‘Animal, Vegetable & Mineral’, Periscope Gallery, Birmingham. ‘Small Works’, Periscope Gallery, Birmingham. ‘Blue Skies’, Custard Factory, Birmingham. ‘Flipside’, St Paul’s Gallery, Birmingham. ‘Birmingham Works II’, Chuck Works, Birmingham. ‘Access all Areas’, Herbert Art Gallery, Coventry. Birmingham Print Workshop at Warstone Gallery, Birmingham. ‘Birmingham Works I’, Chuck Works Birmingham. ‘A Century of Art at Warstone’, Warstone Gallery, Birmingham. Keele University Exhibition with Birmingham Printmakers. Crescent Theatre, Birmingham with Birmingham Printmakers. MA Show at Lanchester Gallery, Coventry University. Spike Island Print Show, Bristol. ‘Pressing Forward’ Midlands Arts Centre MAC with Birmingham Print Workshop. ‘4 Birmingham Printmakers’ at London Print Workshop. Making a Mark’ Custard Factory, Birmingham. ‘Twilight Shift’ Bond Gallery, Birmingham. New Cross Hospital, Wolverhampton with Birmingham Printmakers. ‘Proof’ Midlands Arts Centre MAC, Birmingham, with Birmingham Printmakers. Leicester Art Exhibition for Schools and colleges. Bournville College of Art, Birmingham institute of art & Design two person show with Glenn Griffiths. ‘First Bite’ Wolverhampton Polytechnic Printmakers Degree Show, Midlands Art Centre. ‘Flux-Fest’ Fluxus Festival performance & artwork commission at Vivid, Birmingham. Performer in ‘Yin Yang: You can’t have sound without silence’ by Andrew Phillips, Bond Gallery, Birmingham. 2004 Arts in Sandwell Local Arts Fund Award. 2003 Arts Council England Creative Ambition Award. 1994 West Midlands Arts Bursary Award. 1993 Princes Trust Development Award. ‘Art in Empty Spaces’, Queens Square, West Bromwich for Sandwell Third Age Arts. ‘Arts All Over the Place’ Festival of Arts and Mental Health, Custard Factory, for Birmingham & Solihull Mental Health NHS Trust. ‘Survivor Art Exhibition’ at Birmingham University for the Institute of Applied Social Sciences & Birmingham & Solihull Mental Health NHS Trust. ‘Spring Celebration’s’ at Haden Hill House, Cradley Heath, for Sandwell Third Age Arts.